There was a legitimate reason that I skipped out last week. Miles’s maternal grandmother passed away. It wasn’t anything unexpected as she had Alzheimer’s but, even when you see it coming, it’s unexpected. The funeral was on Thursday (thus we had to coordinate travel and I worked extra on Tuesday night) and, more than anything, it was a celebration of her life. Everyone was grieving, but it was touching, astonishing, humbling to see the amount of people that came out to show their love, share in the grief, and spread their stories about how Betty touched their lives. She was 90 and will be missed. I didn’t get a chance to truly know her, but one word always comes to mind: elegant. She was always so put together and so kind when she talked with me. She’ll be missed, but her battle with Alzheimer’s is at an end. It’s a terrible disease. Full disclaimer: I’m not a nonfiction reader. I have a much harder time concentrating on most books in this genre for some reason, even if I’m enjoying it. I’m really enjoying Fourth and Long, but I’m still having to take long breaks in between reading it. (Plus, yes, I fully admit that I keep getting distracted by other books.) That’s part of the reason I’m trying to challenge myself with this reading list and push my boundaries a bit. Onto the review! I enjoyed A Walk in the Woods, overall. There were some parts (still interesting and fascinating) that I essentially got the glazed look and skipped over the paragraphs. Bryson would fill up half the page talking about diseases one could die from while hiking the Appalachian Trail. He’d do the same talking about extinct or endangered species, plants, the types of foods he missed—you get the idea. It was relevant and interesting, but I still glazed over. The premise of his memoir here is that, after his family settled in Maine, not too far from the Appalachian Trail, he decided he wanted to hike it. Yes, he may have been 44 (pretty sure he was 44 at that point in time) and out of shape and had no clue what he was getting into, but he was going to do it somehow. So, he started reading up on the Appalachian Trail and bought a whole bunch of equipment. It was around the time he sent out Christmas cards when he started to get cold feet and wanted a hiking buddy before he set out in March. Of all the people he sent letters to, Stephen Katz, the friend he hadn’t talked to in years and had essentially had a falling out with, was the one to respond. When Bryson picked Katz up at the airport, he was dismayed to discover that his friend was portly, out of shape, and essentially diabetic. The stories that he relays of their time on the Appalachian Trail are numerous, hilarious, dismaying, and a multitude of other emotions. The research he put into reading up on the National Park Service and other trail organizations, the species that have been wiped out by careless human activity, and the history of the Appalachian Trail itself come together in a poignant story that discusses the way America has changed, how humanity has changed. Some things, though, stay the same. Through the Great Depression, World War II, the Vietnam War, and other historic events, the Appalachian Trail has been there, enduring, for eighty years now. The trail may change (humanity does like to encroach and nature has its own way of changing things), but it’s still there. Bryson’s look into what it’s like to get back to living primitively, being with nature, and learning how to respect it spoke to me. I am enjoying the convenience of living in town for the moment, but every trip that Miles and I go back to his parents’ place and the family farm, I relish the silence (when we get it these days because of the encroaching city) and being able to walk and not see any other people. Who knows? Maybe things would be different if we all took a walk in the woods around the world. For people who love hiking, love camping, love being around nature, they should take a look at this book and read it. 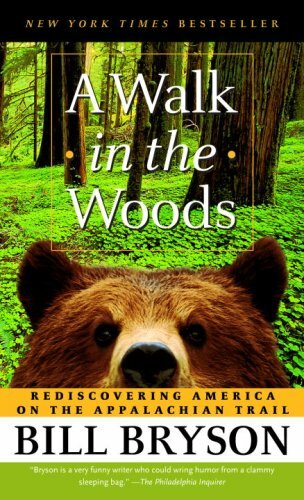 Posted on April 19, 2017 by scrawlandspiritsPosted in Lit TuesdayTagged a walk in the woods, bill bryson, book review, memoir, reading challenge, writing.